15th National Youth Festival organized by Govt. of India at Bhubaneswar, Orissa from 8 – 12 Jan. 2010. Participating in Veena category Mr. A.P. 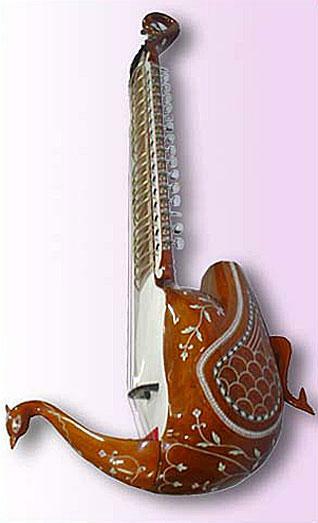 Singh ‘rhythm’ as a participant of Punjab contingent bagged third position introducing Taus (a string instrument introduced by sixth Sikh Guru Sri Guru Hargobind Singh ji in Sikh music tradition) known in Indian music tradition as Mayur-Veena. Taus a word from Arabic and mayur from Hindi language are synonymous of peacock. It was the first time that Taus is introduced in a competition of National level by an Amritdhari young Sikh musician (A.P. Singh ‘rhythm’) and got a place in Indian music by winning third prize including a medal, cash prize of three thousand rupee along with a certificate from the Government of India. A.P. Singh ‘rhythm’ is a student of Department of Gurmat Sangeet, Punjabi University, Patiala initiating M.A. in Gurmat Sangeet under the guidance of world renowned musician, scholar Dr. Gurnam Singh, founder head of the department. Mr. A.P. Singh ‘rhythm’ started his practice in music under the supervision of his father Dr. Kanwaljit Singh, a noted scholar and performer of Indian music tradition as well as Gurmat Sangeet tradition. Congratulating Mr. A.P. Singh ‘rhythm’ on his success Jathedar Harpal Singh Tohra said that it is the victory of Punjab and we should encourage the young talent to work hard to preserve and promote the Gurmat Sangeet tradition. In his message S. Harinderpal Singh Tohra, President Jathedar Gurcharan Singh Tohra Memorial Trust (Regd.) termed the victory as a bench mark for the Sikh youth and praised Mr. A.P. Singh ‘rhythm’ for his achievement in 15th National Yuva Utsava 2010. On this victory Baba Lakha Singh, Chairman, Baba Nand Singh Institute of Gurmat Studies, Nanaksar Kleran congratulates Dr. Jaspal Singh, Vice-Chancellor, Punjabi University, Patiala and Mr. A.P. Singh ‘rhythm’ for their contribution in promoting the Sikh heritage. He assured his blessings for the upcoming young Sikh musicians. A.P. Singh receiving award from Orissa Chief Minister, Shri Naveen Patnaik. A.P. Singh performing at 15th Youth Festival at Bhubaneshwar (Orissa). A.P.Singh playing Taus in Bhubaneshwar.